It’s funny to arrive at Malaga Airport knowing that you’re not actually going anywhere. It’s also strange to know that you’re going past the check-in desks and beyond security to somewhere few passengers ever get to see. I’m with the Costa Press Club and we’re taking a look behind the scenes at Malaga Airport. Today is one of the quieter days. A Tuesday in November isn’t exactly high season. But I still have to lap the car park twice to find a free space, armed police are patrolling outside and there’s that familiar buzz of lots of people as soon as I go through the revolving doors. 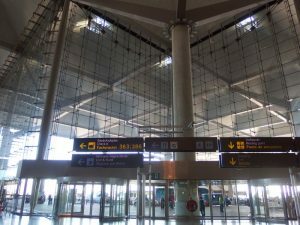 Malaga Airport is one of the busiest places on the Costa del Sol – not for nothing do millions of people pass through here every year. In fact, the day after our visit Malaga Airport welcomed its 15 millionth visitor this year, the highest ever and we still have 7 weeks of 2016 to go. “Malaga Airport accounts for around 25% of the province’s GDP”, says Salvador Merino, Malaga Airport Manager and one of our guides for the morning. 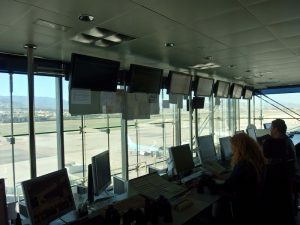 450 people work for AENA, the airport authorities and around 8,000 others are employed at the airport in one form or another. And that’s not counting the thousands (and probably thousands) of indirect jobs created by all these flights. In low season – not for long on the Costa del Sol, currently enjoying its busiest year ever – the airport deals with 230 flights a day. In the summer, this rises to a maximum capacity of 44 planes an hour. Unsurprisingly we didn’t get to go in air traffic control tower, but our first stop was the ground control ‘tower’. Here the staff – 6 during the day and 3 at night – manage all the planes from the moment they land to the moment they leave the runaway. Ground control is a mass of high-technology, radios, phones and binoculars – sometimes you need to get a really good view of the runway. We watch as the staff designate check-in desks, fingers (or parking spots for those hoping to save €140 – see below) and give instructions to the men in those yellow Follow-Me cars. 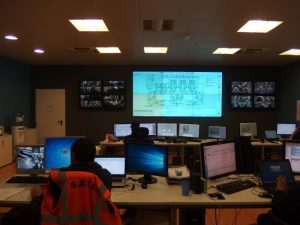 Next stop is the centre of real time incident management, a room that Pepa Villalobos, Head of Press, calls ‘Big Brother’. “After Orwell, not the TV show”, she adds. The nickname is certainly apt because this is the place that keeps an eye on the passenger every step of the way. From the moment they arrive in the carpark (and drive round twice) to when they step on the plane. We watch fascinated at footage of cars double-parked at the pick-up zone outside Departures. “As soon as we see more than a few cars double-parked we call the police”, says Eva, Manager of this section. I’m not the only one to shuffle a little guiltily at this point. Eva reveals that at the last count there were over 1,100 cameras at Malaga Airport. A couple of clicks with her mouse and a long, long list of their locations appears on the screen. Wherever you are there’s definitely a camera watching you. This is Big Brother in spades. This centre ensures you’re never too long in the security queue. “As soon as we see it’s taking longer than 10 minutes to get through we open another security post”, says Eva. Other airports I’ve visited could certainly take a leaf out of this book. As well as dealing with everyday incidents and emergencies, Eva and her colleagues occasionally have to manage those people at Malaga Airport who aren’t going anywhere. Salvador confesses there are a few full-time residents at the airport, but he adds that the authorities can’t really do much about them. “It’s a public space and as such we can’t throw them out,” he says. Eva tells us about a British man who didn’t have enough money for a flight. After some difficulty, her department contacted his next-of-kin for funds only to find he didn’t actually want to go home. Next on our visit is what Pepa calls “the innards of the airport”, aka luggage control. To get to those in charge of the suitcases we have to go through security. This is reassuringly rigorous – most of the 18 of us are frisked,j our ID checked and double-checked, and (as usual) I have my shoes scanned. Pepa and Salvador receive exactly the same treatment. In luggage control we get the low-down on what happens to your suitcase after check-in. The screen on the wall displays a maze of check-in desks (86 just in Terminal 3), security machines (5 different levels) and luggage carrousels. These are known as hipódromos in Spanish, literally horse racing tracks. Surprisingly there are no people involved in this process. It’s totally automated and fully controlled by the six staff in the room. 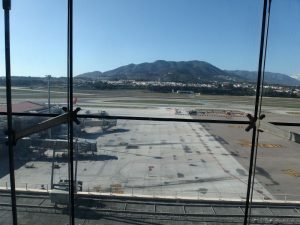 Our guide explains that the security machines in Malaga Airport are especially wide to cater for golf clubs and that the race tracks in Terminal 3 can handle 10,800 suitcases an hour. We discover that under Spanish law a suitcase cannot be opened unless the owner is present. Anecdotes flow freely about customs officers in the US who can and do open luggage on a whim. About lost luggage, although all the staff are super quick to point out that luggage is never ‘lost’, only ‘misplaced’. Apparently your airline company always knows where your suitcase is even when it isn’t where you want it to be. Some 150 cameras spy on the luggage area. Just a tenth of the total but enough to make it difficult to open a suitcase and steal its contents without a camera noticing. As well as thousands of people, lots of animals work at Malaga Airport too. Not just the police dogs but highly-trained falcons, eagles and hunting dogs. Like most airports, one of the biggest threats to planes at Malaga Airport are birds. Even a small pigeon can do major damage to an engine. To combat this, Malaga Airport employs a team of faconers to keep all other birds well at bay. Between 20 and 30 falcons and eagles make daily flights around the airport. According to Pepa, actual times vary to keep the other birds on their toes – apparently, seagulls are notoriously clever at remembering times. Hunting dogs are used to retrieve those birds that miscalculated falcon-flying time and to chase rabbits off the runway. 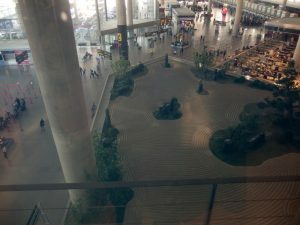 The Zen garden on top of the duty-free shop and next to security. I’d never noticed it before but apparently the views of the carefully raked gravel and graceful palms and bamboos are excellent from the VIP Lounge. By law, all planes have to take on enough fuel for an attempted landing plus the flight to an alternative airport. Most flights carry 1-2,000kg extra. But not all. The Antonov 124 cargo plane creates such massive turbulence the next plane cannot take off or land until at least 5 minutes afterwards. The usual interval is 2 minutes. The luggage centre might be very clever, but it can’t read a ‘Fragile’ notice on a piece of luggage. 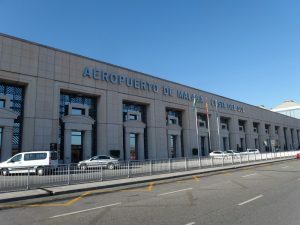 My thanks to AENA, Salvador Merino, Pepa Villalobos, Alberto, Eva and the countless other staff at Malaga Airport for their time and interest. Special thanks to Pepa for arranging the Costa Press Club visit and for allowing us to see behind the scenes at Malaga Airport. Thanks for that, Michelle. Look forward to seeing the pics! Thanks Joanne, Chris here, very interesting. Although they told us OPS controlled the planes from the moment they landed; Ground control is still an air traffic control function. For incoming flights this determines which taxiway, gates, and route to the stand. For outgoing flights this is permission to start engine, permission to push back, and route via taxiways to the holding point at the entrance to the runway. 44 planes an hour is the present ‘old’ runway which is increased to 76 with the new runway in operation. 15m visitors is a misleading term that all airports use. It is actually passenger movements, which counts a visitor arriving and then leaving as two. 15m is still impressive Malaga has overtaken its 2007 pre crisis peak inspite of loosing many of 1,25m AVA passengers to Madrid. None of the other Andalucia airports have done this.